I needed to create some Christmas cards for an order I received and the sketch at Freshly Made Sketches was the perfect starting point. I am really loving this sketch, I think it's a great way to use images with a sentiment! For these cards I used some retired Christmas DSP from SU and the Beast Friends set from MFT. The set comes with several different yeti images and so I used an image of a yeti with a mug and another of a yeti wrapped in Christmas lights. Adorable! These are beautifully colored, and I love the splash of blue on them. Thanks for joining us at Freshly Made Sketches this week! I love those guys sitting on their sentiments! 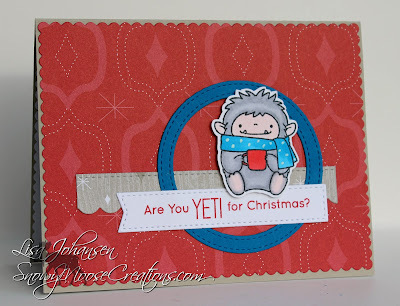 And I love your color combo - a bit of neutral, red and blue is a fabulous look for the Yeti! Thank you for playing along with us at Freshly Made Sketches.